Obituary – Forney, Hubert Jones « Perry High School Alumni Association, Inc.
– active participant in football for the past four years and a member of the DeMolay. He is the temporary mayor of Teen Town. Hubert is the 18 year old son of Mr. and Mrs. C. B. Forney, Perry. He was co-captain of the 1943 Maroon football team and was named all-state guard for 1943. He will report for induction into the armed forces at the close of graduation this spring. 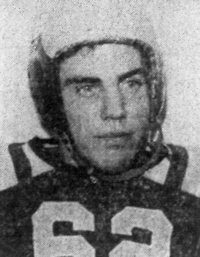 Hubert Forney, 23-year-old former All-State football player, died at 6 a.m. Friday in Benedictine Heights hospital, Guthrie, of polio. His wife, Hazel, a registered nurse who had cared for him throughout the illness, was with him at the time of death, as were his parents, Mr. and Mrs. Charles B. Forney. Funeral services will be at 2 p.m. Sunday in the First Presbyterian church. Rev. R. E. Dreger, pastor of the church, will conduct last rites, with Rev. David Thomas of Stillwater assisting. Burial will be in Grace Hill cemetery under direction of the Newton funeral home. He was born Jan. 11, 1926, in Perry. He graduated from Perry high school in 1944 after becoming noted as one of the most outstanding guards developed on the local football team. He was a member of the Presbyterian church, the American Legion, and a former member of the Order of DeMolay. After completing high school, Forney entered the army and received paratroop training at Ft. Benning, GA. In March, 1945, he was sent overseas to the European theater. His company crossed the Rhine river in Germany and was advanced to the Elbe river, from where he was returned to the United State to prepare for going to Japan. Forney spent seven months in government hospitals in the U.S. He was married June 19, 1945, in El Paso, Texas to the former Hazel Royder, who survives. After receiving his discharge, Forney became associated with his father in Forney’s dairy. Other than his wife and parents, he is survived by a half-brother, Don Kirchner of Oklahoma City; and a half-sister, Mrs. Billie Ritchey of Salem, Ill.